I thought about doing a bit of an update on the first day of the winter meetings, but since I'm not there and I'm getting all of my information the same way you are, I'm just going to do the highlights and discuss Nick Franklin. As far as the update goes, the Mariners are no longer able to sign Mike Napoli since he signed a 3 year/$39m contract with the Red Sox. Other than that, they've been connected to pretty much every single hitter on the free agent market. At least, every hitter that could actually add something of value to the M's lineup. That's not exactly difficult, since the bar is set pretty low, but a middle of the order hitter is better than a bottom of the order hitter. Obviously. With that, we read a tweet and discuss the implications of said tweet after the jump. With that, let's take a look at both sides of the coin. I'm not going to say one way or the other what would or would not be a good idea because, again, I don't know. Unfortunately, baseball operations are not a democracy and we have to live and die by the decisions of the front office. Here's hoping they know what they're doing! Well, okay, let's trade him. In a discussion on twitter, I mentioned that prospects are not absolutes. Actually, what I said was "Prospects are always risky anyway. He may trade geese that lay gold, but could just as easily lay lead." ALL prospects are hit or miss, so why not use them as the commodity they currently are? A team could overvalue a prospect you have in your system and you could fleece the other team. Keep in mind it works the other way too. Everybody remember Mike Morse? Asdrubal Cabrera? Yeah, still kind of stings. Nick Franklin hit .243 and 7 homers in 64 games with Tacoma in 2012. He also hit .322 with 4 homers in 57 games with Jackson before his promotion in the middle of the year. Franklin is also still just 21. He'll turn 22 during spring training next year and his future is bright. At least, by Mariner standards. Why not move a maybe in Franklin for a known entity in Justin Upton? It would probably take a bigger package of prospects, but I'm kind of hoping that Jack Z wouldn't be crazy enough to send both Franklin AND Walker in the same deal. Maybe if it were Upton and some other guy in the Diamondback's system that's highly touted that I don't know. While there have been players like Cabrera and Morse, there are also guys like Jeff Clement and Brien Taylor. Injuries are a real possibility and so is just plain not being worth the jersey you're wearing as a ballplayer. Upton had the misfortune of playing hurt most of the season in 2012 and everybody and their dog knows what he's capable of. He's proven what he can do in the big leagues. 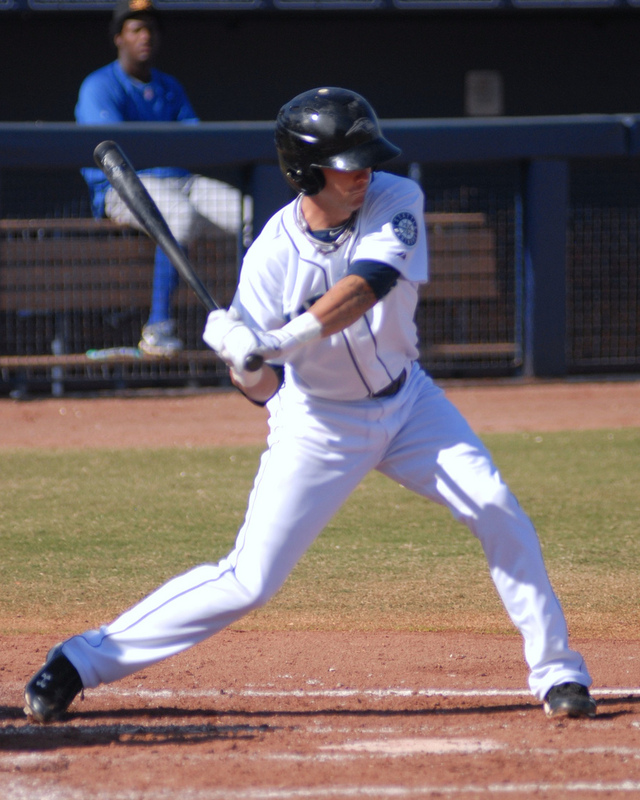 Nick Franklin has yet to do that and while he's young and has the success in the minors, that doesn't necessarily translate into big league success. It comes down to trading a player as yet unknown for a player we all know. The arguments for keeping him are about the same in certain aspects as trading him are. He's young, he's had success in the high minors at a young age, projects well according to most prospect pieces. When I say he projects well, I mean he projects to be a .270ish hitter that can be a 20HR/20SB type of guy. Speed and power in the middle of the diamond are exceptional things to have, especially when the incumbent SS is a guy who hit his way even deeper into a wet paper bag last season. Long term, Franklin may not be a shortstop, but having too many players at a position is a great problem to have in many respects. Moving a player to a different position is far more luxurious than having to scramble at the bottom of the pile for a fill-in type player until you can get something better. *cough* Kevin Millwood *cough* I guess that's not really fair to Millwood, but you get my point. A projectable middle infielder who can field while not nearly as beautifully as the current shortstop, sufficient enough to be a massive upgrade with the bat where runs produced/saved are concerned. You can't say "This guy is untouchable" with every A/B prospect in your system, otherwise no trades would get done, but why not hold on to a guy that can help sooner rather than later and will be under team control for 6 years? Shortstops that can hit, field and has a little pop in the bat aren't exactly knocking on every team's door begging for a job. Outfielders, on the other hand, are much more plentiful and are easier to create from infielders than vice versa. I know I didn't really talk about Taijuan Walker in this post, but mostly because I didn't think I'd have to. He's a guy I think we all want to see in a Mariners uniform sometime in the near future and trading him would hurt a little. As I said with Franklin though, you can't say he's untouchable and then expect to get something valuable in return. If it's between Franklin and Walker, I choose Franklin. If it's both, I pull out my hair, curl up in a corner and beg for the pain to stop. If Jack Z can work a trade where neither of those guys are part of the package and they still manage to get a fairly decent player, I'll be happy. Or sign a free agent and make all of this one big moot point. One such trade I read on twitter was one with the Pirates, where Smoak, Jaso and Noesi would go to the Pirates with the Mariners getting G. Jones and Hanrahan. Yes please! Jaso would hurt a little to see leave the team, but let's be realistic. He'll never be much more than an adequate platoon catcher, which is a lot better than what we've had in the past, but the Mariners need a lot more than adequate. We'll see what happens over the next several days. If the Mariners don't make some kind of a move, it would be a bit disappointing, but not devastating. The winter meetings are only 4 days out of 3 1/2 months of offseason. Signing free agents isn't a quick draw type thing, but it's a lot easier in those 4 days. Not signing or trading for a bat wouldn't be an indicator of anything other than nothing could be worked out. Even so, hopefully in the next couple of days there will be something to hoot and holler about here in an upcoming post. Stay tuned!